Oscar Pistorius has been granted bail while he awaits sentence for murdering his girlfriend Reeva Steenkamp in February 2013. Judges changed the South African Olympic athlete’s conviction from manslaughter to murder last week. The double-amputee has already served one year in prison. Oscar Pistorius, 29, now faces a minimum sentence of 15 years’ imprisonment – to be set after a hearing on April 18, 2016. The Paralympic champion will also appeal against his murder conviction in the Constitutional Court, his lawyer has said. Bail has been set at 10,000 rand ($700). 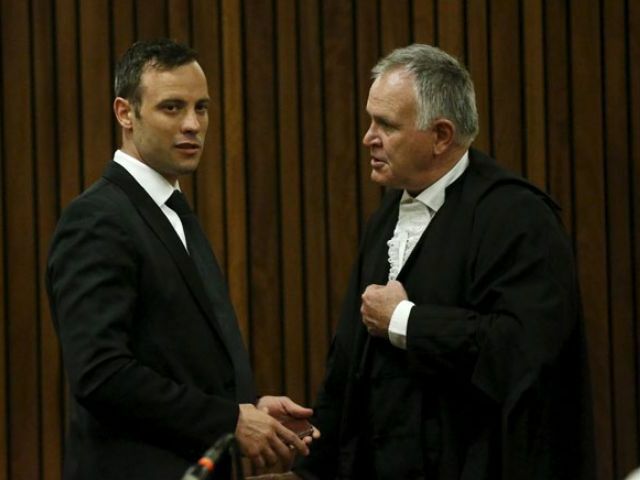 Oscar Pistorius was deemed not to be a flight risk by Judge Audrey Ledwaba. He can remain under house arrest at his uncle’s home until sentencing next year, and will be electronically tagged. He also has to hand over his passport. Oscar Pistorius will be able to leave the house between 7AM and midday, but will only be able to move within a 12 miles radius. In his bail affidavit, Oscar Pistorius said he had no income. During the hearing, his lawyer said he was only able to pay a sum of 10,000 rand for his bail. Oscar Pistorius killed Reeva Steenkamp on Valentine’s Day after shooting four times through a locked toilet door. Last week, South Africa’s Supreme Court of Appeal in Bloemfontein accepted prosecution arguments and ruled that the lower court did not correctly apply the concept of “dolus eventualis” – whether Oscar Pistorius knew that a death would be a likely result of his actions.